There used to be a place in south Cobb County near the Douglas County line that had mineral springs. People would comes miles around to soak up the rich minerals of the spring. The name of the area was Lithia Springs. I remember in the summer time going with my parents to see my father's brother in Douglasville and riding by the resort pool that was within view from the highway, it was always crowded. 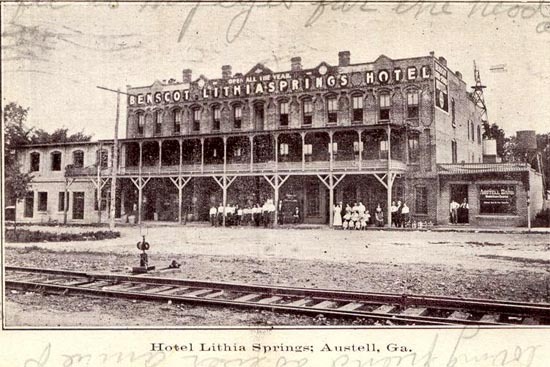 The above is Hotel Lithia that was in Austell, which was the same area. I bet the tourist really got the treatment (wink!). The name Hotel Lithia has a beat to it like Hotel California doesn't it?